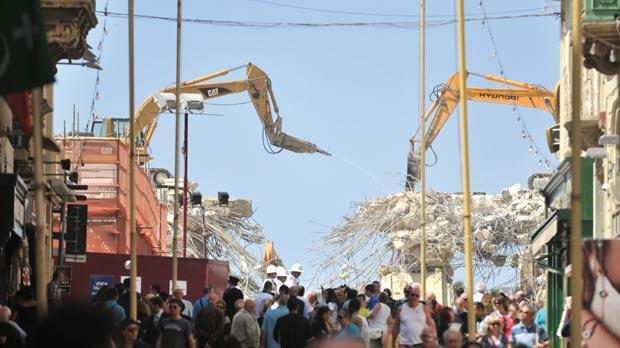 The last strands of steel that formed the roof of City Gate’s central entrance were yesterday torn away by large mechanical claws, as demolition works continued on the Valletta landmark. Stones tumbled down as a mechanical jigger, positioned on the remaining part of Pope Pius V Street above the gate, hammered away at the rock to expose the steel. Like a hairdresser’s scissors cutting through long hair, the mechanical claws then severed the steel that supported the road above the gate – clearing the visual pathway into the city. A jet of water was sprayed to minimise the spreading of dust. Attending the symbolic event to mark the demolition of Valletta’s fourth City Gate, Prime Minister Lawrence Gonzi said the new design will invite people to walk into the city. The work of Italian architect Renzo Piano will reveal the grandeur of the bastions, he said, adding that the project was running on schedule and according to budget. Infrastructure Minister Austin Gatt said that underground works have already been carried out, such as the laying of the foundations of the new Parliament. Building above ground will start between July and September. The new Parliament and opera house in Freedom Square are expected to open in the first quarter of 2013, he said. Project director Jean Marc Smits said the plan is to reopen the entrance into Valletta for pedestrians in the third week of May. Due to safety concerns, pedestrians visiting Valletta have been redirected along a passageway through the Central Bank, near St James Ditch, which leads to the top part of Ġlormu Cassar Avenue. If all goes to plan, the Valletta entrance will not have to be closed again during the project, as workers will build the new gate and bridge while people use the area, Mr Smits said. By the end of the year, the three bastion-like blocks that will form the new City Gate are expected to be in place. He added that the bridge will be narrowed down to its original width. Dismantling works on City Gate started on Monday, with the removal of fixtures. The original gate, known as Porta San Giorgio, was built between 1566 and 1569. In 1632 it was replaced by another gate that consisted of a central archway with a smaller arch at each side. In 1853 a third gate was built consisting of two central arches and two smaller ones. The current gate, known by many as Puturjal, a corruption of the name Porta Reale was inaugurated in 1964. Its doorway was widened to cope with a greater influx of people. Many criticised the new City Gate because it did not blend in with the rest of Valletta’s historic buildings.